To start the blogging year, I’m looking at some debut crime fiction. The author Alan Parks worked in the music industry in London for many years, but recently returned to Glasgow to write. Bloody January is the first in a planned series of novels set in the 1970s and featuring Detective Harry McCoy. The first thing that hit me on reading the novel was the vivid setting: McCoy’s Glasgow is a city of great, grimy buildings – from the opening scene in Barlinnie prison onwards – and gloomy pubs. It’s a place in the midst of change, where those in the know can take advantage; but also a place where old power and money still hold sway. Harry McCoy travels to Barlinnie on 1 January 1973 at the behest of the notorious Howie Nairn. The prisoner has a tip-off for McCoy: a girl named Lorna will be killed the next day. It’s not much to go on, but McCoy does his best to work out who this Lorna might be. He’s waiting at the bus station for her to arrive in the city centre for work when he hears a gunshot. He is too late to save Lorna, but not too late to miss the teenage boy who shot her turn the gun on himself. Shortly after this, Howie Nairn is found dead in the showers at Barlinnie; McCoy takes it upon himself to find out just what has gone on and why – even when doing so brings him into conflict with his superiors. I found Harry McCoy a compelling character to spend time with. He’s an unusual figure in the Glasgow police force: Catholic background, grew up partly in a children’s home, yet made detective by the age of thirty. His boss Murray took a shine to McCoy when few others did, but Harry is no teacher’s pet. In the children’s home, he was saved from the most severe punishments by Stevie Cooper, who has grown up to become a key figure in Glasgow criminal underworld. The two still find each other useful contacts, and whenever McCoy may have doubts Cooper is quick to remind McCoy of how much he did for him. This helps steer McCoy’s characterisation away from the stereotypical ‘bent copper’ who’ll do whatever he wants to get a result and satisfy his urges. Rather, Harry McCoy is presented an individual who, almost of necessity, lives on the edge of the underworld and knows the risks if he reaches too far in. Bloody January takes us on a tour of McCoy’s world, from the fringes of society to the seemingly untouchable Dunlops, Glasgow’s richest family. It’s a brisk journey that I thoroughly enjoyed; I’ll be looking out for more tales of Harry McCoy in the future. 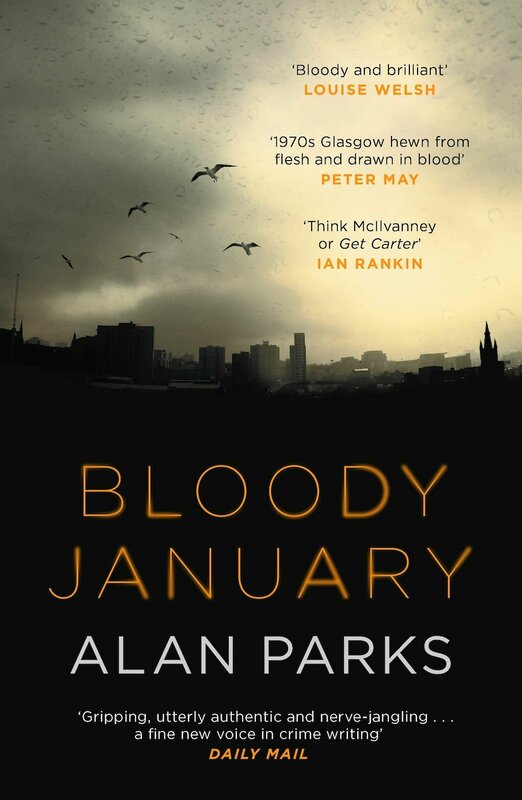 Bloody January (2017) by Alan Parks, Canongate, 336 pages, hardback (review copy). The US edition of Bloody January will be published by Europa Editions in March 2018.